Thanks again to all my backers. I will be updating you with printing details and publication dates as soon as I have them. Also, I’ll be sending you a survey to get your address (and t-shirt size if you wanted one). Women’s basketball rocks! And so do the people who support it. $15 will get you a signed copy. $25 will get you a signed copy for yourself and a thoughtful gift for your best wbb friend. $100 (I’m looking at YOU coaches) will get you five signed copies for your starting five, ’cause young players NEED to know the history of the game their playing. As a 20-year-old with both a passion for basketball and a deep sense of responsibility toward family, Taj McWilliams-Franklin would go to the old practice gym at St. Edwards University in Austin, Texas, at 6 o’clock each morning with a basketball in one hand and a baby carrier holding her infant daughter, Michelle, in the other. She felt the need to work on her game, but couldn’t allow it to come at the expense of motherhood. Such workout sessions began defining who McWilliams-Franklin would be for decades to follow. She became one of the most accomplished players in WNBA history while also distinguishing herself as a strong mother figure, not only for her three daughters, but her adult teammates, as well. She needs that duality in her life. That’s why she left behind all the trappings of professional and Division I college basketball to attempt to transform Post University women’s basketball into a successful program. An authentic American athlete has a fresh blotch on her bio, so it might help that she also has uncommonly sturdy innards. 2) On that same scores page, the score frames span the entire page so that the left scroll button covers up half of the first score. It needs to be resized so that there is a gap between score and edge. 3) Many pages – the box scores, the all-time leaders page are examples – do not resize horizontally based on one’s browser dimensions. The font is too big and the rest of the information simply goes off the right side of the page. 4) Those oversized pages also do not present a horizontal scroll bar so it is impossible to view it. I have had to reduce the font size in order to fit it all onto one page. 6) Resizing the main page any smaller than full-screen on my laptop will cause all the menu items in the header to disappear. They are actually collapsed on the left hand side but that is not intuitive at all. The roster page no longer lists number of years in service next to a player’s name. That at-a-glance feature was useful. 9) Many links are still pointing to the old DNS which makes them useless. On the Storm page, this includes revenue-generating links like how to purchase ticket plans or register for the fan road trip. So far that seems to be the same story on the Dream and Sun sites that I checked. 10) The standings page has started the season already. It is listing the pre-season games as win-loss. Hopefully this will get cleared before June 5th. 11) Every single ticket link that I saw on the schedule page is broken and redirects back to the main team page. 12) The headers for the drop-downs also have old links attached to them so if you click on them it takes you back to the main site again. 1) Where would you suggest we go to check injury reports, latest transactions (updated within the hour), historical numbers for all players who no longer play for the league, and other statistics and facts that sports fans tend to want to know? None of these are available on the website. New York’s Epiphanny Prince (Russia), Los Angeles’ Kristi Toliver (Slovakia), Indiana’s Shavonte Zellous (Croatia), Atlanta’s Celine Dumerc (France) and Minnesota’s Anna Cruz (Spain) are among those who will miss WNBA games and face potential fines from their teams or the league. The winner of the Eurobasket earns a berth in the 2016 Rio Olympics. From Indy: Miss Basketball. National champion at Purdue. WNBA player. Successful college coach. And now Stephanie White is leading the Indiana Fever. Nearly every one of Stephanie White’s early coaching stops played out void of fanfare. They include one season as an assistant for the Ball State University women’s basketball team, the following winter in the same position at Kansas State and two years at the University of Toledo. If I said this were a story about a WNBA player who talked about doing yoga and feeling refreshed … who said she is learning to appreciate sunsets, cookouts and walks in the park … who uses terms like “relaxed” and “lightness” to describe her current state of mind … whom might you guess it was? Probably not Atlanta’s Angel McCoughtry, right? While being one of the best women’s basketball players in the world the last several years, McCoughtry often has been paired with adjectives like complex, intense, inscrutable, mercurial and moody. The lights are on Maya Moore. She knows it. Maybe it explains why she speaks in measured and balanced tones when challenging colleagues, reporters, and as usual, herself. The reigning WNBA Most Valuable Player and dazzling 25-year-old Minnesota Lynx veteran guard wrote an in-depth first-person story for the Players Tribune magazine in April about the lack of visibility for the league, overseas struggles and women’s basketball in general. In addition to bringing the issues out in the open, Moore offered solutions and suggestions for enhancing the sport during an exclusive discussion with Womhoops Guru (this blog, not the Guru himself) on Wednesday when the Lynx played the Mystics in a preseason game. A caring, personable ambassador, Moore’s motivation was simple. In NCAA news, the transfers have landed. It’s Villanova for former Vol Jannah Turner. it’s South Carolina for former Yellow Jacket Kaela Davis. It’s Texas for former Commodore Khaleann Caron-Goudreau. It’s Oakland for former Blue Demon ShaKeya Graves. The Savannah State University football program and women’s basketball program have been ruled ineligible for postseason play because of a failure to meet minimum APR scores, according to the NCAA. In addition, the SSU women’s softball team is facing level one APR penalties and the men’s and the women’s basketball team is facing level two APR penalties while the football team also faces level three APR penalties. It’s pretty common to hear that Title IX creates a huge financial burden on colleges such that even if a school is lucky enough to be making millions on football or basketball, federal law mandates that a certain amount be spent on women’s sports. Leaving aside how this story implies schools are being forced to support women’s sports against their will (which I hope isn’t true), it also misses the fact that in some circumstances, women’s sports make money. Yes, so-called “non-revenue” can be profitable. This isn’t saying they always are, because the conditions need to be right; but when they are, a school that is out of compliance with Title IX because it doesn’t have enough women participants could actually add a sport and increase its net cash in-flow after expenditures. Seems counter-intuitive, right? But it’s true. Come join me on a short, economic journey through arithmetic-land, where the only bias is a strong belief that when facts and common sense collide, facts win. BTW: Joanne is now only $265 away from her Kickstarter goal of $2500 to support the publishing of “Finding a Way to Play.” That means if 18 WHB readers give $15, not only will they get a free, autographed copy of the book, but they’ll help her reach her goal. Come on, folks – love the game? Love its history. Donate. Think about this: If everyone who looked at this blog today donated $15, not only would they get a signed copy of the book, but they’d help blow Jo’s goal out of the water…. Jacki Gemelos’ Chicago Sky WNBA box score: 16 minutes, 4-7, +24. Honestly, who would have ever thunk that? Katie Douglas was a 6-foot-1 girls high school basketball player running the point long before such God-given backcourt leverage was fashionable. The 1997 Perry Meridian graduate helped usher out single-class hoops while at the same time forcing observers of the girls game to think differently. “With Katie there was no good way to defend her,” said longtime Franklin Community High School girls basketball coach Walt Raines, whose Grizzly Cubs have long staged battles against the Falcons. From the Huffington Post: Should Those Who Spoke Out Against Donald Sterling do the Same With Isiah Thomas? The seven families are writing in behalf of former players Taylor Tuck, Sarah Livingston, Amarah Coleman, Taylor Gleason, Alexis Smith, Nia Oden and Jacqui Grant. “If you’re transferring to be in a graduate program, the NCAA wants you to be working in earnest toward that degree rather than just using up your last year of eligibility,” Kevin Lennon, the association’s vice president of Division I governance, told the Associated Press. Really? The NCAA wants Utopia? Well, then let’s have Mark Emmert solve the budget deficit, immigration reform and Middle East conflicts. Were the 14 freshmen who declared for next month’s NBA draft “working in earnest” toward an undergraduate degree? The 15 sophomores? The NCAA has no business attempting to police or discern an athlete’s motives. No one should care if a graduate transfer cares about getting a master’s. It’s about damned time that we all stopped harassing sexual harasser Isiah Thomas for becoming president and part owner of the New York Liberty women’s basketball team, pending board approval. So listen up, disgruntled female hoopsters! Let us not think of the sexist pig’s rise to the heights of your sport as the height of absurdity/insanity/disrespect. Let us instead think of it as the height of female liberation! After all, we women have finally reached true equality. If the man who cost Madison Square Garden $11.5 million in a sexual harassment suit can still get the top gig in women’s sports, just think of the possibilities. No, not for you. For them. Success came in leaps and bounds for the Flat Rock Rams this year. Both the boys’ and girls’ basketball teams won District championships, with the girls adding in a Regional championship. The regional crown was the first in school history. For their efforts the girls were honored at a recent City Council meeting. The girls that are seniors on this team are the first group to have went through the Flat Rock Recreation League program from first grade through High School. For a man who didn’t even play basketball in high school, let alone college, Steve Freeman has had a one-of-a-kind career coaching the sport. The long-time coach, who has been an assistant with the girls basketball team at Shawnee High School, will be honored for a storied career when he is inducted into the Oklahoma Girls Basketball Coaches Association’s Hall of Fame on May 30. Dabbs said she enjoyed the column about Beth, who lives in North Carolina and is an ordained Episcopal priest and a cancer survivor. And that is true. She did. Standing just 5 feet 3, Lauren Saiki was sometimes the smallest player on the basketball court. But her signature thread-the-needle passes and heady ball-handling propelled the point guard and her teams from Alhambra Mark Keppel High to four consecutive playoff appearances, capped by last season’s run to the Division II state championship game, a first for the school. Saiki, 18, has earned a basketball scholarship to West Virginia. For all this, she can credit the fundamentals she learned while playing for more than a decade in a Japanese American basketball league. What’s cool is this continues the long history of women’s Japanese-American basketball on the West Coast. Before, during, and after World War II, Nisei youth clubs offered hundreds of city girls like Ide a place of camaraderie and belonging where they could play basketball and baseball, socialize with boys, develop leadership skills, participate in community service, and forge lifelong friendships. In an era when Japanese-Americans faced racial barriers to social acceptance, these clubs enabled urban teenagers to claim American identity and enjoy the pleasures of popular culture. A half-dozen journalists attended the second day of Storm training camp Monday. All were interested in one player: Ramu Tokashiki. A 6-foot-3 forward, Tokashiki stands out in the basketball world in Japan. Nicknamed “Taku” (pronounced TOCK), Japanese slang for strong, she signed with the Storm to be challenged by WNBA players. Tokashiki is expected to make Seattle’s regular-season roster. It would make her the third Japanese player to compete in the WNBA. 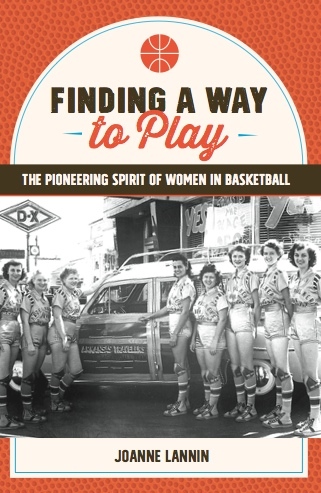 I’m asking for your help in order to self-publish my latest book, Finding a Way to Play: The Pioneering Spirit of Women in Basketball, this spring. My book is full of stories that reflect the pioneering spirit of women from many different social strata and many different eras. Chapter one brings Senda Berenson, the mother of women’s basketball, who carefully modified the rules (and enhanced the teamwork necessary) to keep her sport from being banned by physical educators and medical professionals in the 1890s to life. A later chapter includes the career of Hazel Walker, whose team of women mostly from Arkansas, carried a gun to ensure their safety as they drove their station wagon across the country in the 1950s looking for a good game. That’s Hazel and her team in my cover photo, designed by graphics artist extraordinare, Sue Schenning of South Portland, Maine. This book draws from an earlier book I wrote 15 years ago, A History of Basketball for Girls and Women, which is now out of print. In that book, I wrote very little about the rich history of black women and Native American women who endured racist taunts and slurs, and unequal treatment as they traveled great distances seeking opportunities to play. My new book rectifies that omission and also includes heartbreaking stories of lesbian players who have had to hide their identities to protect themselves and preserve their places on the court. Another chapter profiles some of the senior women in their 60s, 70s and 80s who ignore their bodies’ aches and pains – and sometimes, doctors’ admonitions – to continue playing a game they may have been denied the opportunity to play when they were young. My book is written. It is in the final stages of layout and design and should be ready to publish by the middle of June. I have secured the rights to all photos, chosen a cover design, and created an index and a photo credits page. I need to obtain an ISBN, choose the best printer for the project, and begin marketing efforts. Joanne is halfway to her goal – skip a couple of coffee’s this week and help move her towards completion! Former Knicks Head Coach and President Isiah Thomas has filed paperwork to become part-owner of the WNBA New York Liberty, a decision whose final approval now rests with the WNBA Board of Governors. If Mr. Thomas is officially voted into position by this group, he will work in the same office from which he was once disgraced and with many of the same colleagues who were there when the former Knicks head coach was found guilty of sexual harassment of his colleague, Anucha Browne Sanders. Although Mr. Thomas continues to deny responsibility, the jury verdict ultimately resulted in MSG paying $11.5 million in damages for sexual harassment and retaliation. Every day, young girls across the country hone their skills in hopes of one day scoring the winning basket on a college court or in the WNBA Championships. The WNBA’s message to those girls if Mr. Thomas is approved as part-owner of the New York Liberty is that sexual harassment – inexcusable behavior in any other workplace – is not only tolerated but is instead rewarded at the WNBA. When Donald Sterling was found making disparaging racial comments, he was banned from professional basketball for the rest of his life. The same rules must apply to sexual misconduct and the WNBA. We implore the WNBA Board of Governors heed this recommendation and show the league’s millions of supporters across the world that they respect women from their executive suites to their season ticket holders to their youngest fans. Deny Mr. Thomas’ ownership of the New York Liberty. YES! I believe sexual harassment is a serious issue. Published May 7, 2015, read the Foundation’s Open Letter to the WNBA Board of Governors here.